Home > Introduction to Wine > How is Wine Made? There are many variations on the basic wine making technique although essentially the production of wine can be broken down into a few main stages.For information on how Champagne is made see other related articles. Before a vine is even partway towards being harvested a myriad of decisions have been made, many of which have developed over centuries. In fact, the mixture of science and random effects that have led to the specific characteristics of wines on some of the oldest European vineyards, make it impossible to describe exactly how certain a grape, land and climate combinations were chosen. However, these important decisions have been arrived at and are vital to the pre planning of a wine. In a vineyard that has all the conditions for a great wine to be produced already in place, one can only be thankful that the hard work has already been accomplished. In a New World vineyard the conditions that exist in European vineyards have been as far as possible reproduced and in a fraction of the time that those vineyards honed their wine making skills. This has led to an advance in viticulture – the science of winemaking, to such an extent that New World enthusiast will mock the ‘random’ element of European wine production. Europhiles, on the other hand point to the sterile scientific and industrial methods employed in the New World, which are said to accord with vulgar and over simplistic attributes.For further information see related article: ‘Terroir’. Choosing the right time to harvest a grape is the next important factor. The correct time to pick a grape will depend on a host of factors including colour, variety, ph levels and flavour. From here grapes are removed from their stems, generally using machinery, although old-fashioned hand picking is still sometimes employed. This process is sometimes reffered to as ‘de-stemming’. Some varieties, such as Burgundy Pinot Noir are made with the stems still on as this compensates for low levels of ‘tannin’. The grapes are then crushed (in the old days underfoot!) or pressed using machinery, before being placed in tanks. 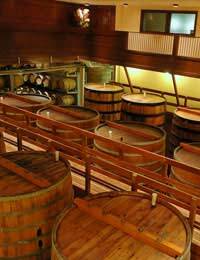 Fermentation takes place in tanks, and is a natural process that be aided by the addition of yeasts, or by yeasts existing in the atmosphere after consistent fermentation over years. The amount of contact a wine has with grape skins will affect its flavour, colour, aroma, acidity and tannin levels. During fermentation the skins will rise to the surface of the vat. In the case of red wine, where prolonged contact with grape skins is desirable the skins will be pushed back down into the wine. In the case of white wine the skins will be removed after 24 hours or so. White wine is treated further to remove skins, and also ‘cold stabilized’ following fermentation. This prevents the formation of ‘tartrate’ crystals, which can have an adverse effect on both the appearance and flavour of a wine. Once fermentation is complete the yeast will die leaving a wine that is generally between 8 and 15 percent in alcoholic volume. The yeast is then removed and the wine is ‘racked’, or pumped out from the vat until completely clear. Many wines will still have a yeast residue at the point of sale, which can be removed through ‘decanting’ (see related article).A process of ‘fining’ is then used to remove further impurities that may interfere with the final product. Further mechanical filtering takes place prior to final bottling. The cork and the bottle variety are both said to have an effect on the final outcome of a wine, which accounts largely for the wide variety of different bottle shapes, on the shelf, any of which relate to the region that the wine is made. Some wines are made in Oak barrels, leaving a rich, smoky taste. This is common with full bodied whites such as Chardonnay. The wine will continue to change in flavour and colour once in the bottle, and this is accounted for in production, with many wines having a specific projected maturation phase. Good storage (see related article) will ensure that a wine reaches this phase.